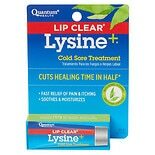 Shop Quantum Lip Clear Lysine + Cold Sore Treatment (.25 oz. ).25 oz. $999$9 and 99 cents$39.96 / oz.